Ukrainian Prime Minister Arseny Yatseniuk tendered his resignation in a televised broadcast on Sunday and signalled support for parliamentary speaker and presidential ally Volodymyr Groysman to take over his post. Yatseniuk has resisted pressure to resign since surviving a no-confidence motion against his government in February, but Ukraine’s political crisis has fractured the ruling coalition and further delayed the disbursement of aid under a $17.5 billion International Monetary Fund bailout programme. “I have taken the decision to resign as prime minister of Ukraine. 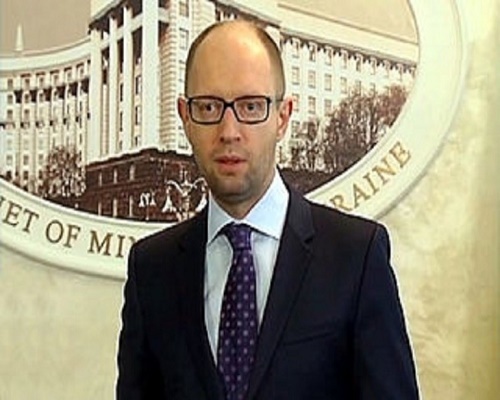 On Tuesday, April 12, my request will be submitted to the parliament,” Yatseniuk said in televised broadcast. “The political crisis in the country was created artificially. The desire to change one person blinded politicians and paralysed their political will for real change. The process of changing the government turned into a mindless running in place,” he said. President Petro Poroshenko’s faction (BPP) and Yatseniuk’s People’s Front party were expected to announce the formation of a new coalition next week. In his speech, Yatseniuk said his party was committed to the coalition and appeared to hand over the reins of government to Groysman. “We cannot allow destabilisation of the executive branch during a war. This would be inevitable, if after this resignation a new government of Ukraine is not selected immediately,” he said. “The parliamentary faction of the Block of Petro Poroshenko has nominated Volodymyr Groysman to the post of Prime Minister. Having done everything to ensure stability and continuity of our course, I declare my decision to transfer the obligations and responsibilities of the head of government of Ukraine,” he said.